I thought I'd put together a round-up of all of my past patterns that you might want to make this winter. It's sort of trippy to look back at all of these! All of them started off as kits, but the kits (except for a couple, which are noted) are all long-since sold out. PDF patterns are available for every one of these patterns, and they are linked to through the photos and the text. People do ask if we will ever "get more" of the kits for these older patterns, and unfortunately the answer is, at this point anyway, no. We (and by "we" I mean me, and Andy, and a trusty assistant that is working for us at the time) actually put every single one of our kits together ourselves, by hand. It works for us to produce kits when a design is launched because there is a lot of interest and we have the numbers that make it possible for us to pay for all the stuff that goes into every kit, including the labor and the assembly. Once I get on to other things, I'm also usually too busy to go backwards and remake kits. As it is, I have a half-dozen ideas I'm wanting to pursue right now, and I only have so much (and it's not much) mental bandwidth available to keep things happening. . . . But I'll talk a little bit here about places I know where you can get supplies to make these things, and hopefully that will help you find what you need. So, first off, at this time of year, I think everyone is thinking about making ornaments. I designed six collections of embroidered felt ornaments, one each year starting in 2008 with the last one coming out in 2013. I truly loved making these. All of them are made from wool-blend felt from National Nonwovens. I love this felt. Single sheets of it are available on-line at CommonwealthFelt.com. I know a lot of people sell National Nonwovens felt on Etsy, too. All of my ornaments were made with DMC floss, which is available at any craft store. I have a list of all of the felt colors and floss colors I used available here. These are not specifically sourced in the individual patterns, so you will need to consult this list if you want to get the exact same colors I did. Otherwise you can use any kind of felt you want as long as long as it is not too soft. I don't like working with very soft felt, personally. You also need to make sure that all those stitches don't just rip your felt to shreds. So get some lovely, sturdy felt and go for it. (I guess I still have some of the old labels on these photos. Ooops. Must change that.) Anyway, above is Ice Skating Afternoon. Then there's Walk in the Woods. Here is Snow Day. You'll need cross-stitch waste canvas for the mitten, which is this stuff. Then there was Sweet Home. And we still have kits available for this one. My personal favorite, Winter Cabin. Okay. If you prefer to cross stitch, I'VE GOT YOU. If you need cross stitch supplies, try 123stitch.com. They usually have everything I need. Oh, Winterwoods ABCs. I still love this one. I designed it after we went to that cabin. Love and Joy was for Christmas 2016. You could easily change that 6 to an 8. This one is the first that fits easily into an 8" x 10" ready-made frame, which is nice. And then First Snow. This was the first of my seasonal series from 2017-18. Also fits in an 8" x 10" frame. If you would like to make some softies for good little girls and boys, these do not take as long as you'd think. All patterns for all animals and clothing can be found here. A few people have written and asked whether I am still working on the girl dolls I started earlier this spring that are based on these animal bodies. And YES, I am planning to produce those patterns and kits for the dolls and LOTS of their clothing. That is on my list for 2019, after I finish Secret Garden. That doll project is bonkers -- probably the biggest one I've ever done, and I got kind of overwhelmed by it and all of my ideas for it. But it is still happening. Lastly, if you just want to stay cozy and snuggle, try the Calicozy Quilt. We have two of them, one for me and one for Meems, and we both still use ours every single day. I'm making her a new one for Christmas for her new (well, my childhood) Jenny Lind bed (I wound up ordering bed rails and boxspring, but they haven't arrived yet). ***Also, we will have a new winter lotion bar available next week if the tins I have ordered are correct. Stay tuned for that — I'll post it on Tuesday morning along with a couple of advent calendar reveals! Very excited. Thank you for putting this together! I have always loved your ornaments...the details are amazing and make them so beautiful and special!! I've been decorating for a few days but now have time to start a project. or do some baking. hmmmm what to do first? Have a wonderful, relaxing, and very joyful December! I have a couple of your cross stitch kits and have started one...it will be finished at some point in time. Somehow I got busy knitting for a new grandson and that took over my life. I love your work and ready everyone of your posts. I love all the photos. Still "working" on my Love and Joy cross-stitch, which I decided to do on navy linen and it's beautiful but very difficult to see. Whoops! For anyone considering buying a lotion bar, they are divine and the packaging is wonderful. I bought a doll pattern a year or more ago and really want to make it for my girl one of these days. Maybe over Christmas vacation. Oh my goodness! Well, of course I want to make All The Things, but especially the ornaments. But of course I won't make any, at least this year... :-( But what fun it will, when and if it does become possible. Window shopping is very Christmasy! What a wonderful walk down memory lane with all your patterns and kits! I love of all these projects so much. I have things you have designed all over my house(including lots of kits that I am stockpiling). I actually finished your quilt today. I love it. And I have one more quilt kit left. Once I have sewed some cool nutcracker costumes, Christmas pajamas and a Christmas dress, I plan to make another ornament. Not very winters-ish or Xmas-ish, but I adored your Scarborough Fair skirt! I wear mine all the time. I am working on your beautiful Love and Joy cross stitch (and just last night changed the 6 to a 8!). I try and do a little every night in front of the fire and I'm loving the sense of Christmassy calm it provides. Thank you! 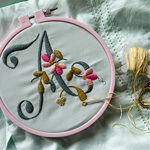 I love this post, and look forward to stitching my Posie ornament stash. We are soon-to-be empty nesters, so I plan to console myself with your kits when the time comes😊. I am, however, making slow progress with Love and Joy and enjoying every second I’m able to spend on it. In fact, I took a mental health day off from work early in November specifically so that I could have the house to myself and watch Hallmark Christmas movies all day while I stitched Love and Joy. Pure bliss and the best early Christmas present I’ve ever given myself, hands down. I am so thankful for your gift of creativity and the warm inspiration that you share on your blog and in your shop, very happy places, indeed. Enjoy the Season! Looking forward to the advent calendar reveals! Oh, I'm so looking forward to your new winter lotion bar! I've enjoyed my morning with my latte and reading your post - as usual love hearing about your lovely world. I am soooo glad you share your obsessions with us! We get to enjoy all your lovely items and I try to purchase them all through the years. Now I need to start finishing up things on my to-do list - I should call it my never ending to-do list. I love this time of year and the cozy weather and making those cinnamon ornaments with my grandkids will be time well spent together. I'm so glad you will offer more boxes because I missed that, but I truly do not know what these look like - I've never seen one. It sounds like you need to make the process easier before you go stark raving mad! Thank you soooo much for sharing with us and Happy Holidays! Hello! I just wanted to take a moment to tell you what a blessing your creativity is to me, and no doubt countless others. I've followed your blog and IG off and on for a handful of years now, and it never stops inspiring me. I love the sweet, dainty beauty, and warm colors you use. I've been in a particular rough couple years of my life- I'll spare the sad details, but I am a single mom of 4 young children, and things can feel pretty SERIOUS all the time. I've let myself get stretched too thin. Last night I felt that gentle nudge from the Lord to just BREATHE, and pull out something to CREATE. And He was right... as I clumsily got back into the rhythm of embroidery, just the simple backstitch across the fabric forming a clothesline for a sweet "Home Sweet Home" pattern soothed my heart rate, helped me slow down and just... delight. Color and art and beauty always delight me. 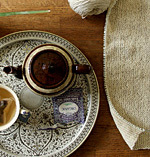 And then I hopped online this morning, on a mission to seek out some more beauty and inspiration from Posie Gets Cozy! That was all long winded, but I wanted to just thank you, for sharing your talents and creativity and joy with others. You never know who just might need a lifeline of beauty. :) I've been eyeing some kits for years now, and I think this might be just the year to treat myself and get something from your shop I've always wanted. Happy creating, and Merry Christmas! Thank you for the wonderful walk down memory lane! I have made several of these patterns over the years. My granddaughter has several of the softies to play with; I've made several Cozy Quilts, and can't forget the Daisychain ABC Crewel sampler (might be my fav!) Thank you for the inspiration! Happiest of Holidays to you and your family! Oh Amelia, what a trip to read those baby posts! I remember each one! I have been reading for years and years, and your joy in motherhood is something that always makes me so happy, as I share that same joy and wonder at finally, finally being a mom and having a perfect little one to raise and love. I read a few old posts and smiled the whole time. BTW- in one you said ‘Maybe when she's six I'll make her the prairie maxi-dress and bonnet in pink calico, just like mine.’ I feel like you did that, right? You have made cute calico dresses and bonnets, surely? What a neat thing to look back at looking forward. Amelia’s hair IS so much lighter now! My 6 year old boy’s hair was blond as a baby, and is a medium brown now. So neat to see the changes, how they are losing their toddler chubbiness, how they are getting so independent. So aware of the world around them. Mine actually doesn’t want me to kiss him any more, which is heart wrenching. But he still gives and gets hugs, so I’ll hang on to that! You and Andy are fabulous, enjoy the beautiful holiday season!! Thanks so much for answering question about felt dolls still coming. Looking forward to it! Happy Christmas! I have those Christmas ornament kits. Almost all of them I think, but I haven't made one. Despite that I want you to know that love these ornaments and treasure them. And one day I will make them when I get over my little house making obsession. So in the meantime, they are lovingly stored away until I can bring them to life - just like you bring your ideas to life. And it is always a pleasure to see your new ideas. Loved this walk down memory lane and I hope to make something this winter from the list here! You are so talented. I mean that! Thank you so much for walking us down this sweet memory lane. I so appreciate the way you share your gifts with all of us out here; they are a part of your legacy, and will outlive you in the most beautiful way. For your felt ornaments, Is it listed in the pattern what fabric you used for the curtains, or do you remember what it was? Also, all of the sequins and beads, is there a specific color blend & brand that you used? thank you. Those ornaments are just so cute, the details so lovely! Every year I hope to make some... they would look so great on our tree.